Wouldn't it be awesome to have access to Vibranium? We can't stop thinking about all the awesome inventions that are available in Wakanda. Those EMP discs that the Black Panther uses to non-lethally stop the soldiers in the rainforest would be so nice to use on folks that are driving recklessly in the streets of our neighborhoods. We think someone could start a super successful taxi cab business with the remote driving transmission the Shuri came up with, especially if customers could drive around with someone with Shuri's personality. 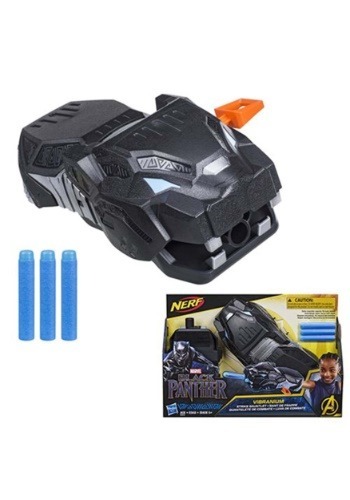 Well, until Wakanda decides to open themselves up to the world, we'll have to settle for this sweet Vibranium blaster gauntlet! Nerf has gotten ahold of Shuri's awesome panther gauntlet design to give us a hint of what it feels like to be tough like her. Kids can slide this blaster onto their hand and shoot out one dart at a time. Pull the tab at the side to prime the darts, and your kid will be ready to keep enemies at bay. While it comes with three darts, this gauntlet can hold two darts at a time. This is the perfect way to polish off any Shuri costume! Whether your little one is dressing up as Shuri this Halloween or she's just a fan of the quick-witted teenage scientist, she's sure to love playing with this gauntlet. With geometric detailing around the face and a dart shooting feature, you'll feel like you have a little Wakandan wonder in your household. And hey, at least your kiddos don't expect to surf on cars with a spear in their hands any time soon. Maybe it's just us but that seems kind of dangerous.